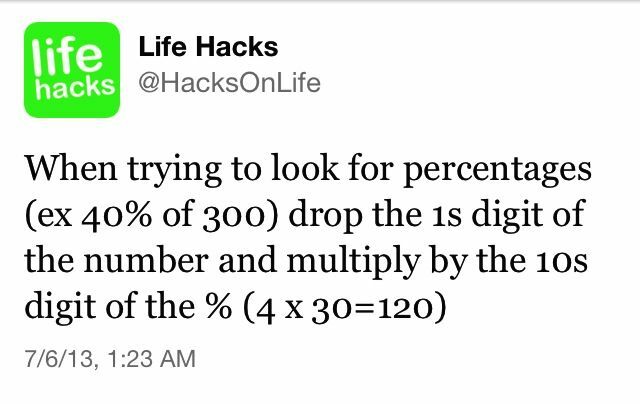 Smart Math Hacks That I Wish I Had Learned Earlier! Here are some math hacks that would change your lives, especially if you learned them early in your life. I would have enjoyed my math homework better if I had learned them when I was young. Gosh! Now I know why I didn’t have enough time for playing. 2. Butterfly method for adding ans subtracting fractions. No more fighting over dinner table! 6. Figure out what date will fall on what day of the week any time … GENIUS! 7. How to convert Fahrenheit to Celsius and vice versa all in your head… You will be math genius among your friends! 8. Fingers make math easy and fun again! 9. How To Remember Which Sign Is Greater Than and Which Is Less Than: Alligator always eats the bigger number! It is actually a method used in Japan. Here is video demonstration. With those, try to solve this math problem and see how much do you still remember about your elementary math knowledge.